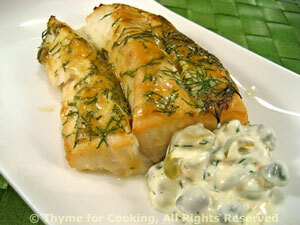 Grilled Cod with Green Olive Caper Tarter Sauce, Thyme for Cooking. I get a long piece of cod 'back' that is without bones and perfect for grilling. Cut it in half for easier handling and serving. In a small bowl whisk together the vinegar, mustard, oil and 2 tsp dill weed. Spoon over the cod. Cook on barbecue grill, covered or partially covered, 14 - 18 minutes, without turning. OR put on baking sheet and roast in 400 F oven for 15 - 20 minutes, depending on thickness. It will be opaque and flake easily with fork when done. Chop olives and capers if the are large. When the fish is done, transfer to a small platter and serve, Caper, Green Olive Tarter Sauce on the side.